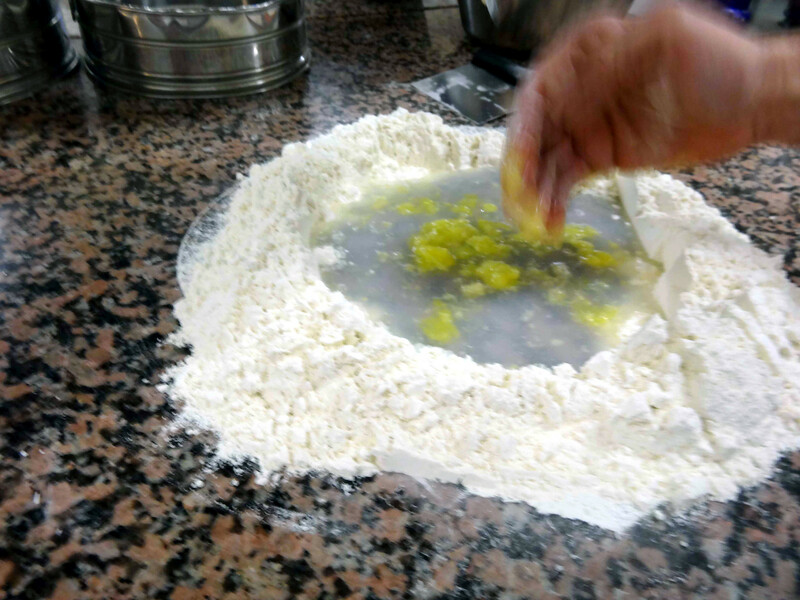 Remove the pan from the heat , and pour 1/3 of the boiling milk on top of the eggs' mixture stir with a hand whisk. 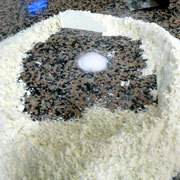 Put the mixture on the head and bring to the boil at small heat . 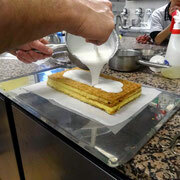 Cook the custard for 2-3 minutes and whisk the it continuously. 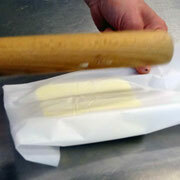 Leave the custard to cool to 50 -60 °C and incorporate the soft butter. 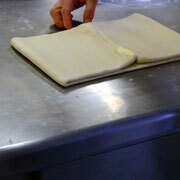 Firstly make the détrempe - a simple dough composed of flour, salt, water and butter. 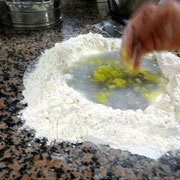 Using your fingertips, gradually incorporate the flour, starting from the inside of the well. 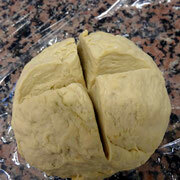 When the mixture thickens, use your hands to bring it together until ot forms a dough. 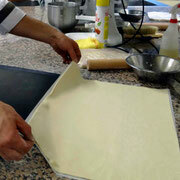 Wrap in cling film and put in the fridge for about 30 minutes. 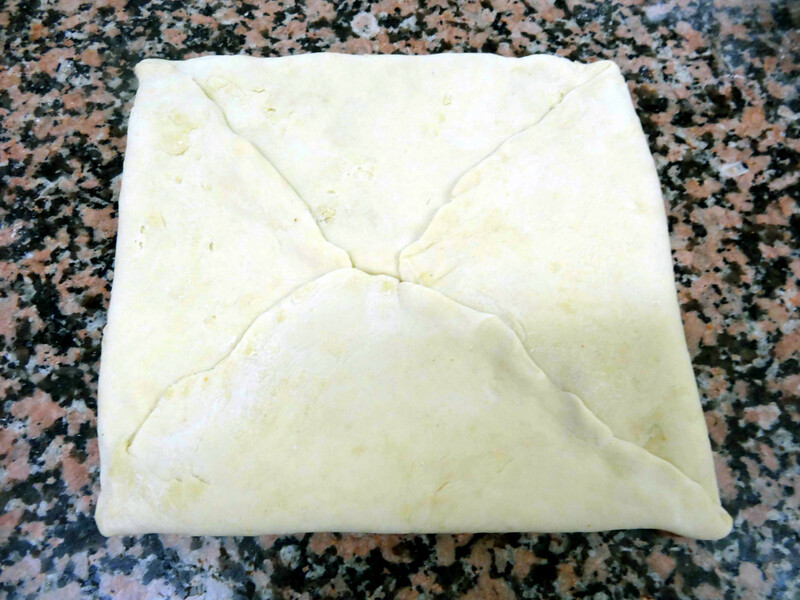 Put the butter between 2 pieces of greaseproof paper (Picture 4) and flatten out with a rolling pin until it is a rectangle 20 cm x 20 cm (Picture 5). 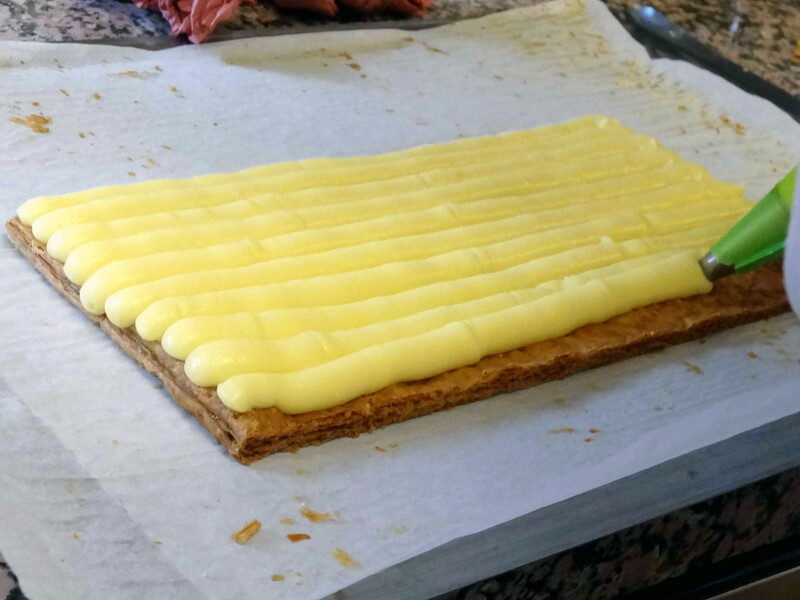 Store flat in the fridge for 30 minutes. 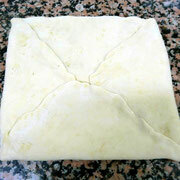 Take the detrèmpe out of the fridge and roll each quarter until a square 40 x 40 cm is formed (Picture 6). 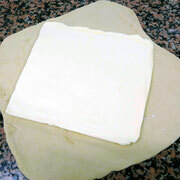 Take the butter out of the paper and put on the dough rectangle. 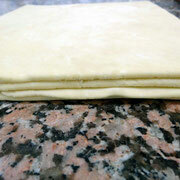 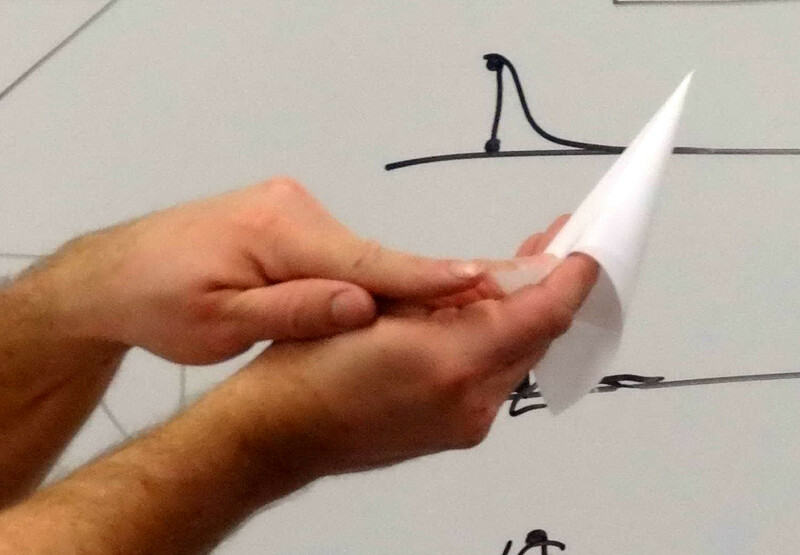 Bring the corners of the dough together to make an envelope (Picture 7). 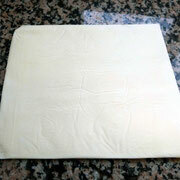 The detrempe is folded arround the butter to form the Paton. 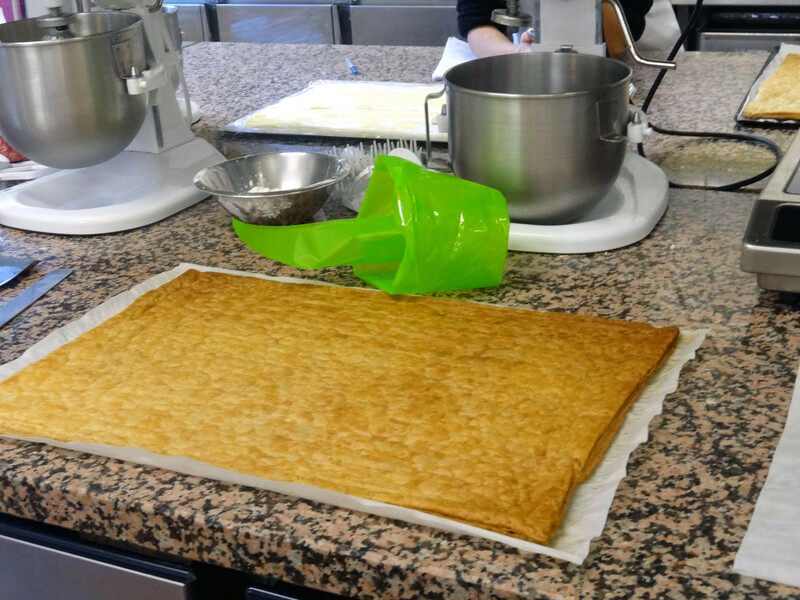 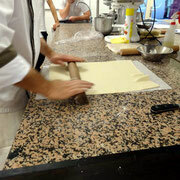 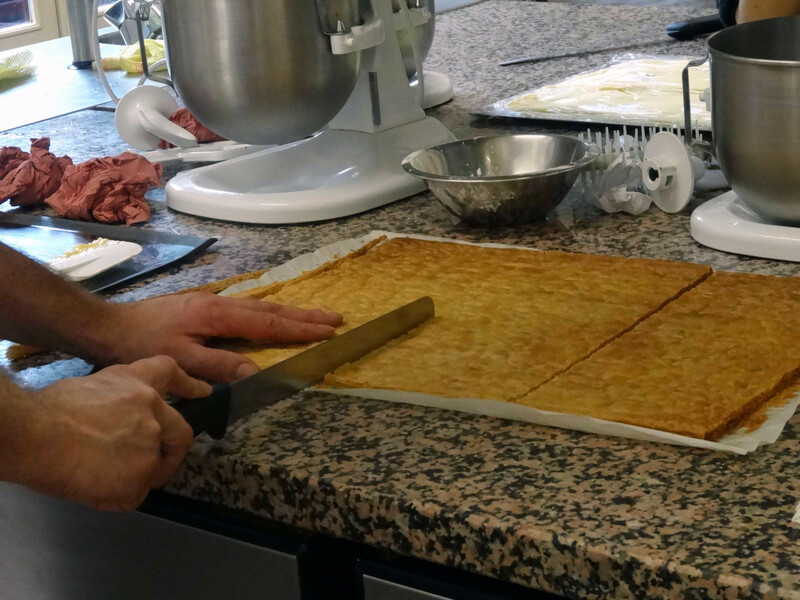 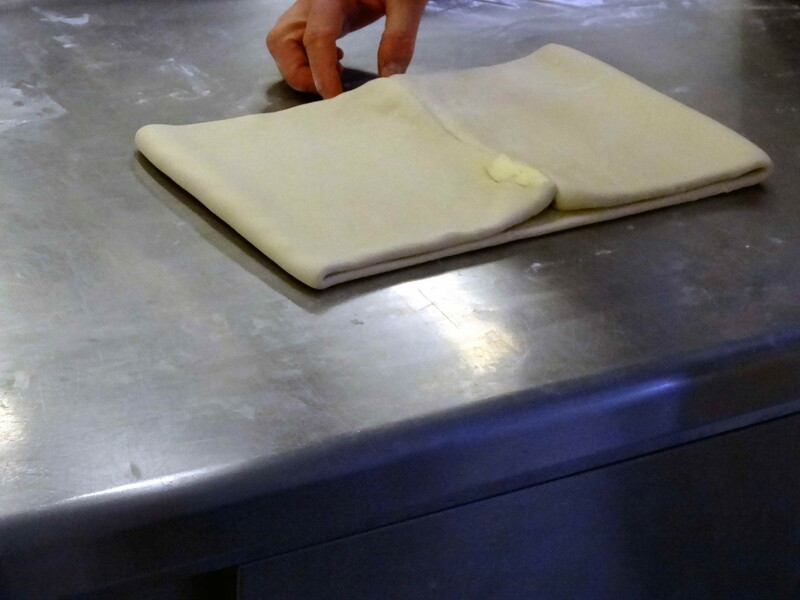 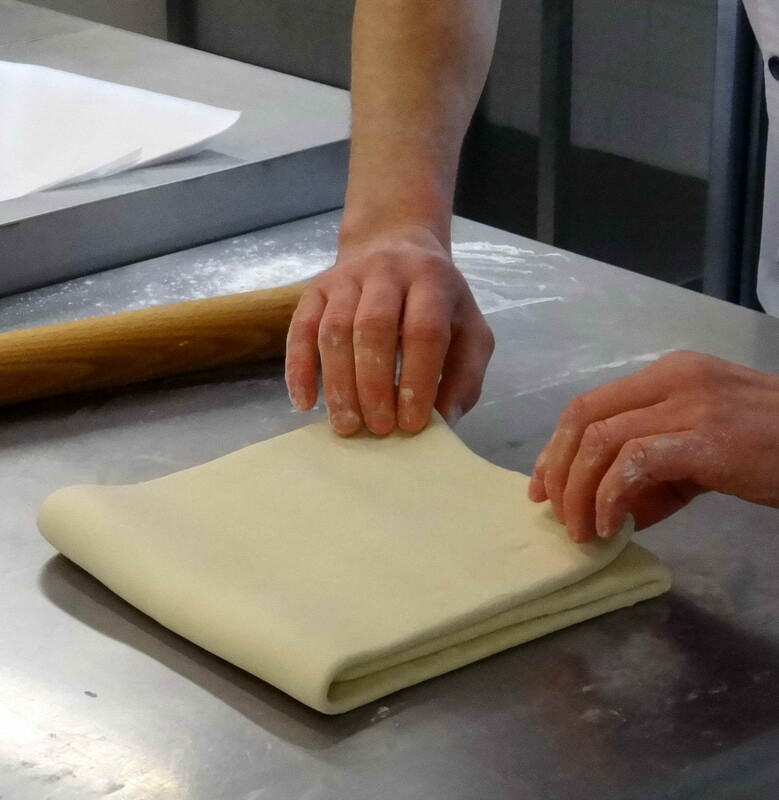 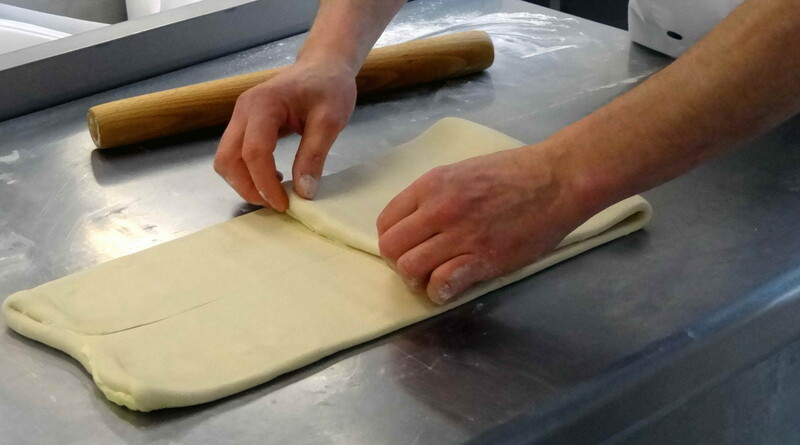 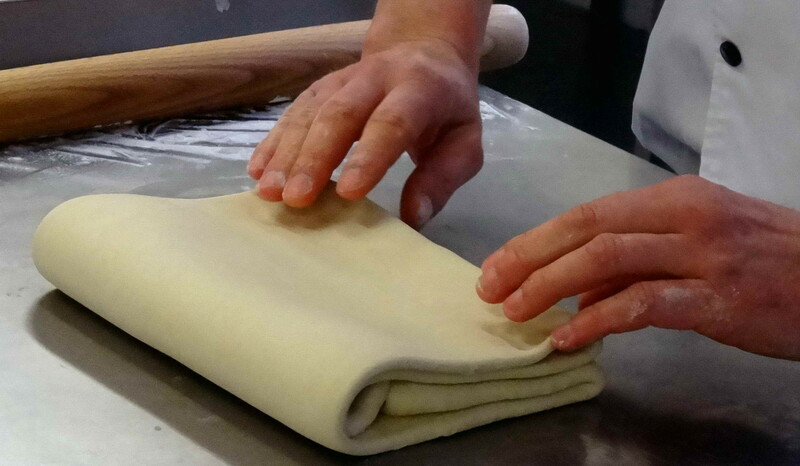 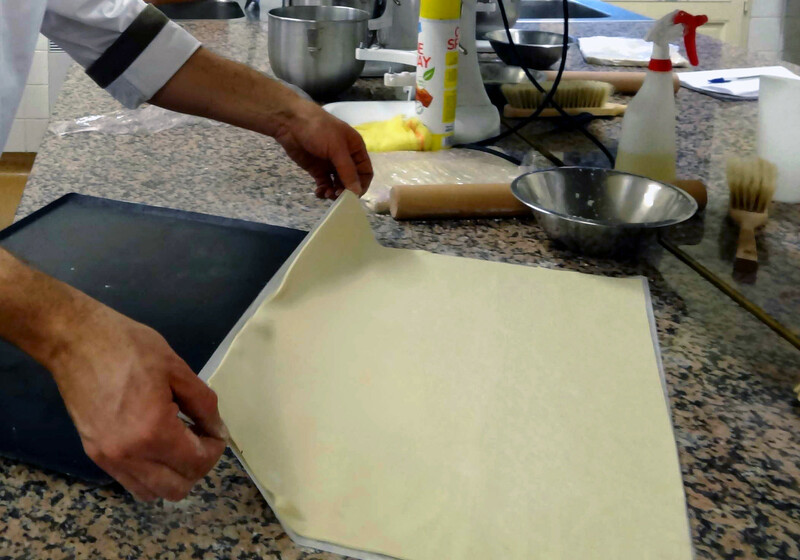 Roll out the pastry to a rectangle 30 x 60 cm. 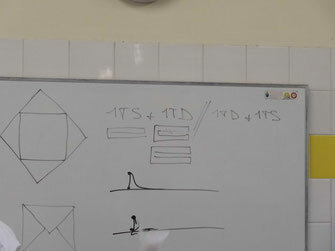 This is equal to 2 single turns. 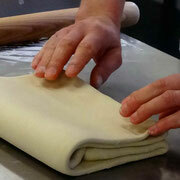 Wrap in cling film and put in the fridge for 30 minutes - 1 hour. 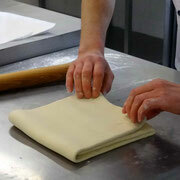 Repeat, making a double turn and single turn. 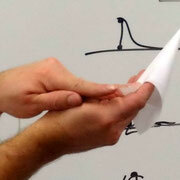 Use two fingertips to make the indentations in one corner so that You will know how many turns you have completed. 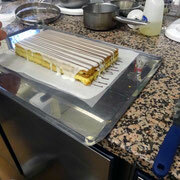 Once completed 6 turns wrap the Paton in cling film (plastic wrap) and put it in the fridge to rest for 1 hour. 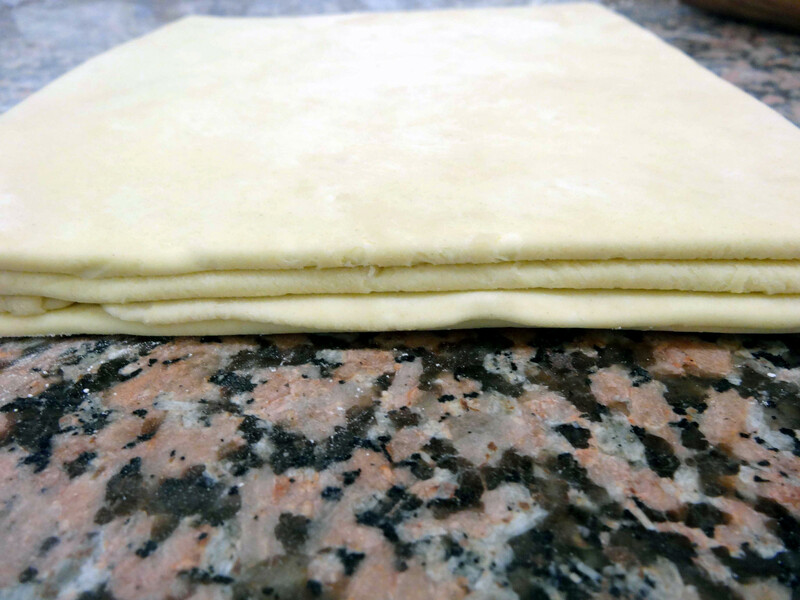 At the end place the puff pastry on the sheet of backing paper (Picture 15) and a pick entire surface of the dough with a fork. 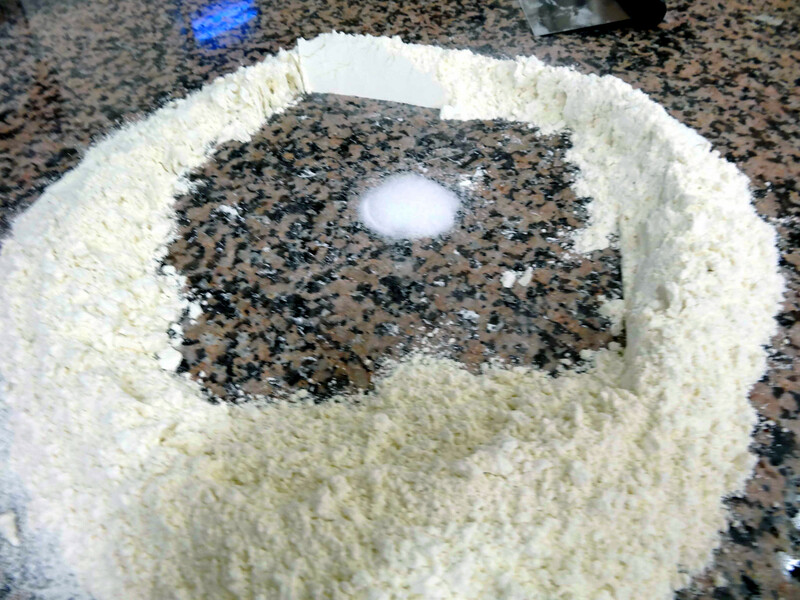 At this step You can cut your gought into 3 equal rectanglesin order to get them the same size. 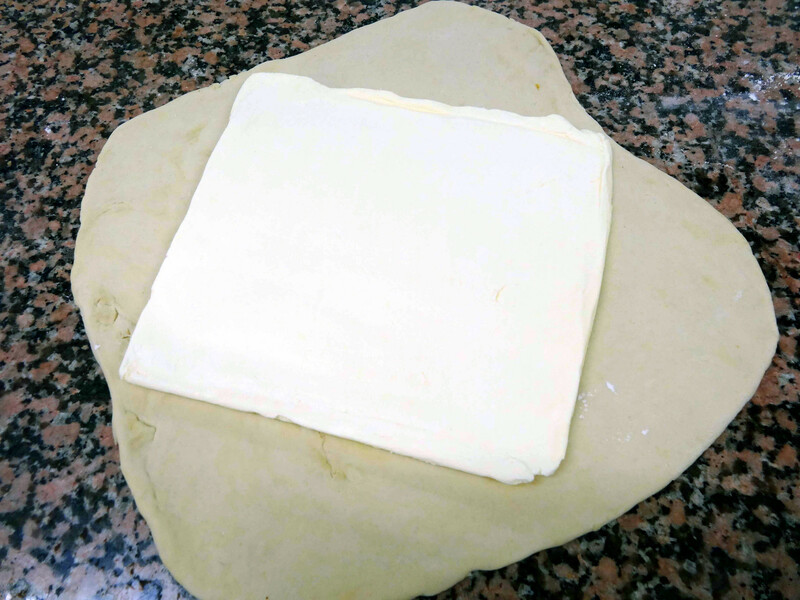 Then place the dough on the baking tray and cover it with a backing papre and wire rack (Picture 17) to stop it from rising excessively. 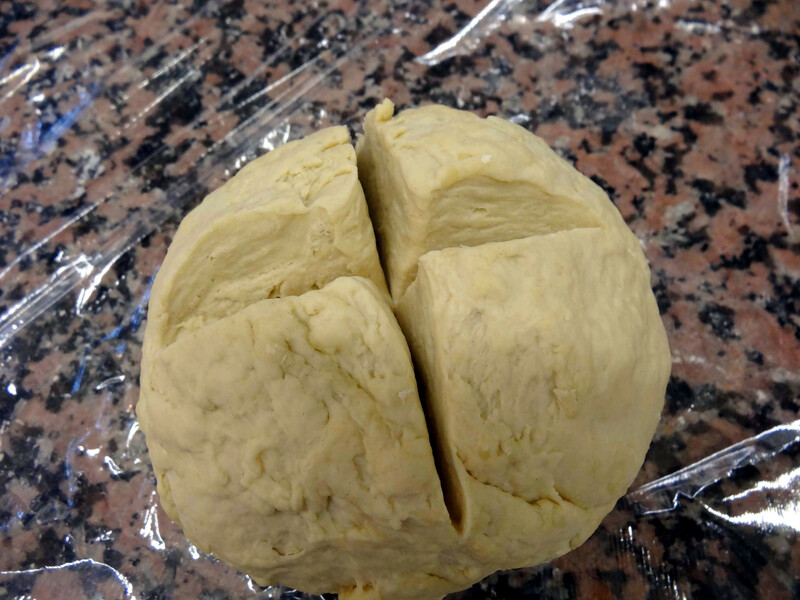 Bake for 45 minutes (180°C). 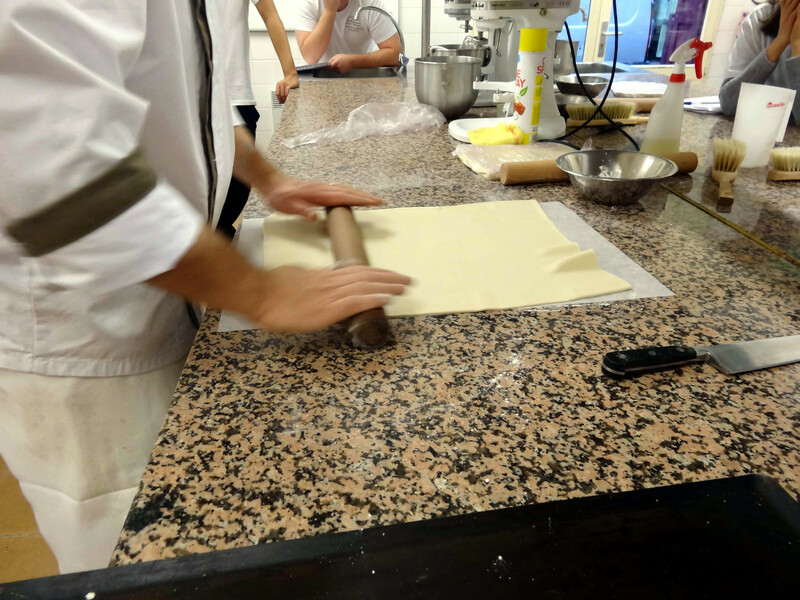 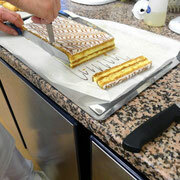 At the end You can remouve the paper and the wire rack and put the pastry back in the oven for 6 to 10 minutes. 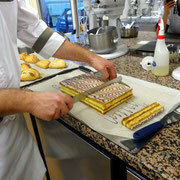 Check out the colour of the pastry, it could be golden brown (Picture 18). 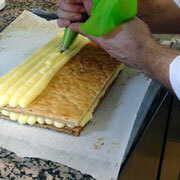 Fill a piping bage fitted with a medium size round nozzle (N 12-14) with the Patissiere cream. 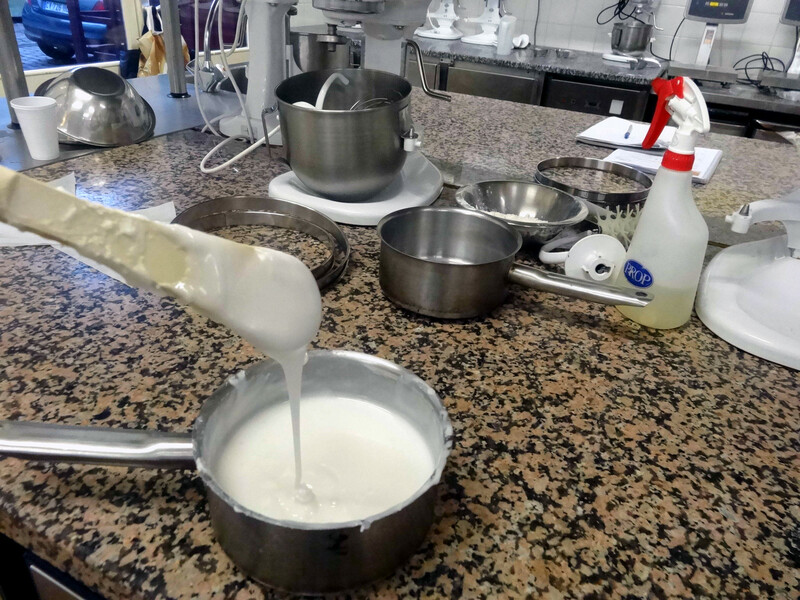 Fondant can be heated directly in a saucepan to the temperature 32-35°C (90-95°F). 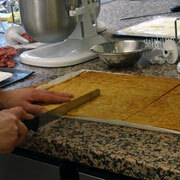 You may need to adjust the consistency a little by adding water to soften and make it a good workable. 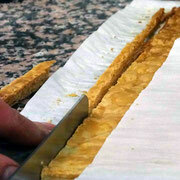 The consistency should be fluid but thick enough (Picture 26). 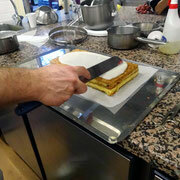 It's important to not overheat the fondant otherwise it has a tendency to cristalize. 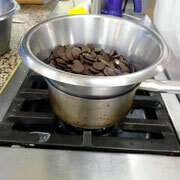 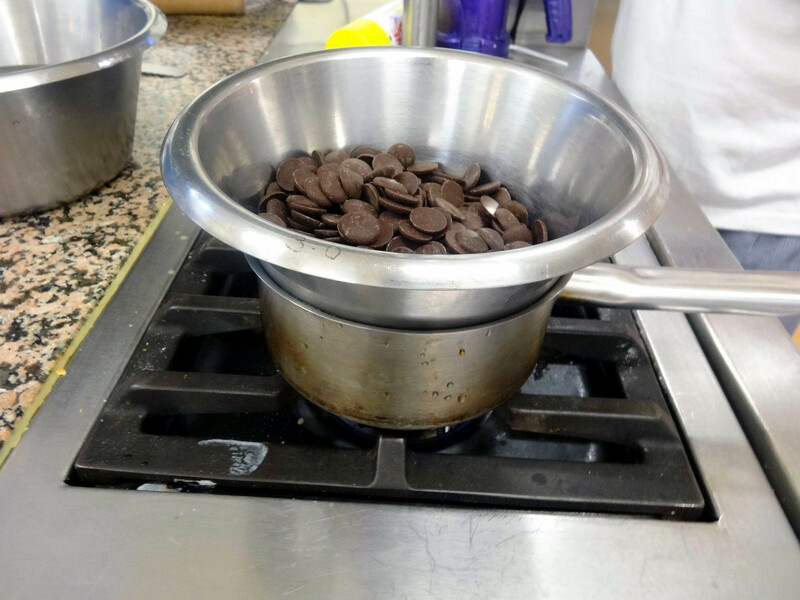 Warm the chocolate on bain-marie (Picture 27) until the chocolate has completely melted. 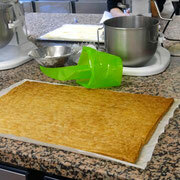 Make a parchment paper cone (Picture 28 ) and fill the cone with melted chocolate just before start the icing. 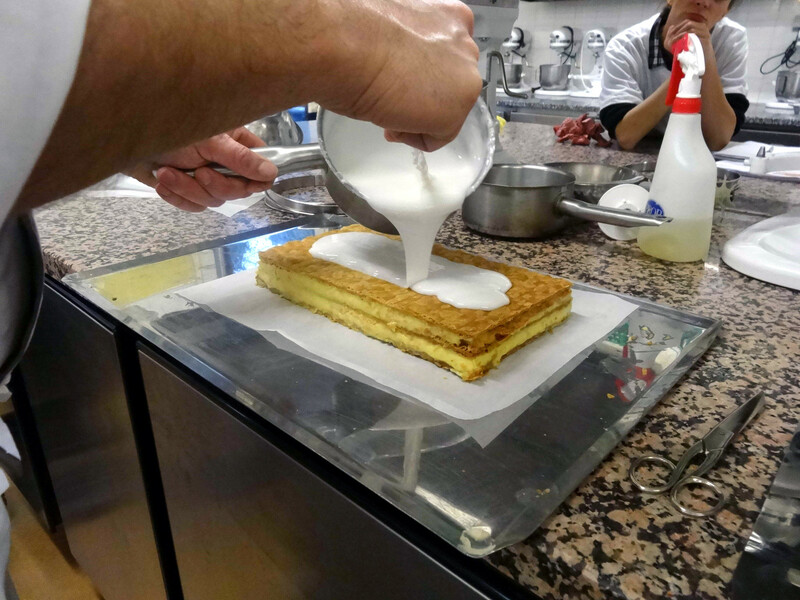 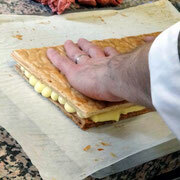 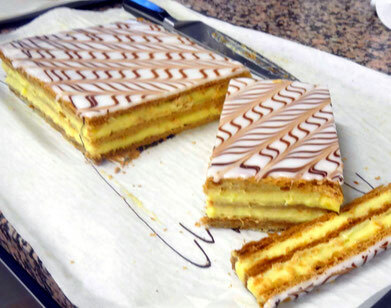 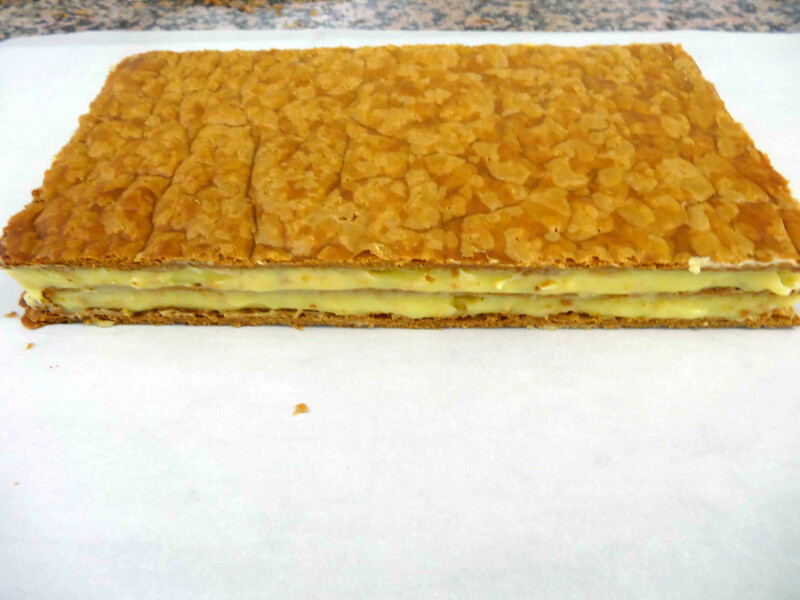 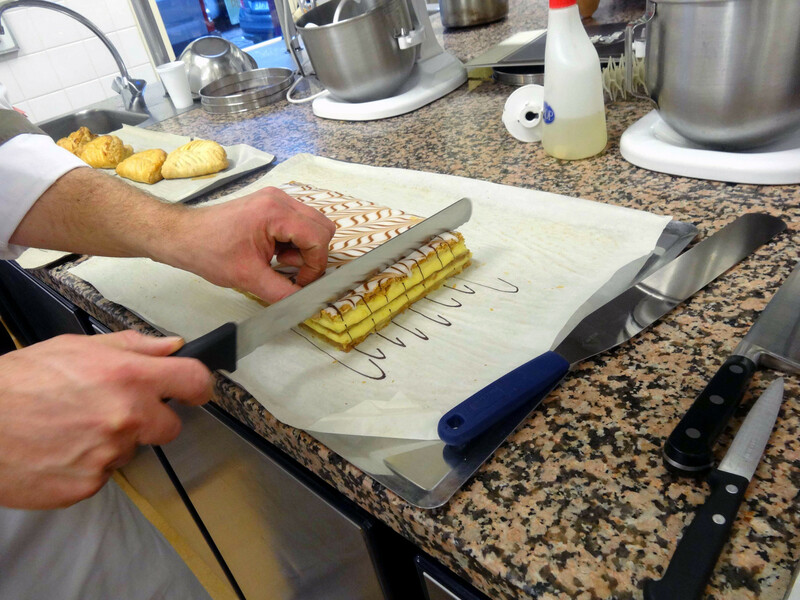 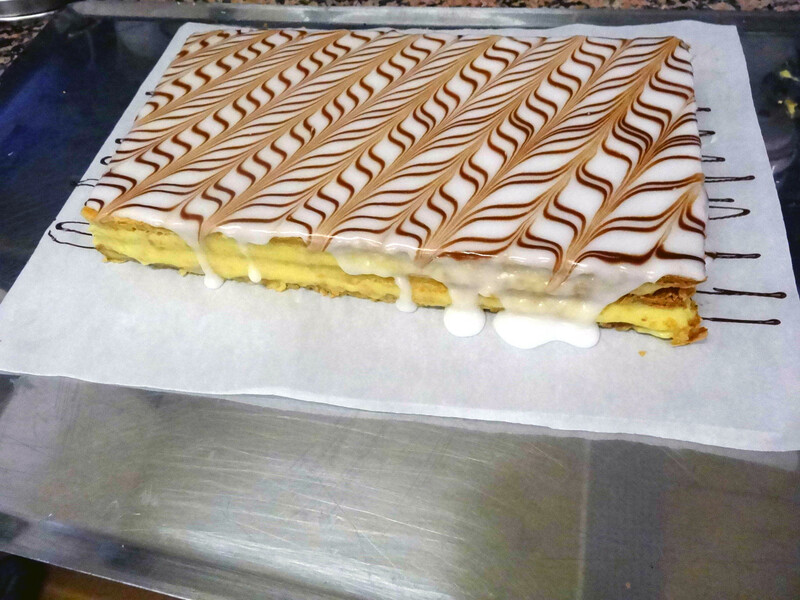 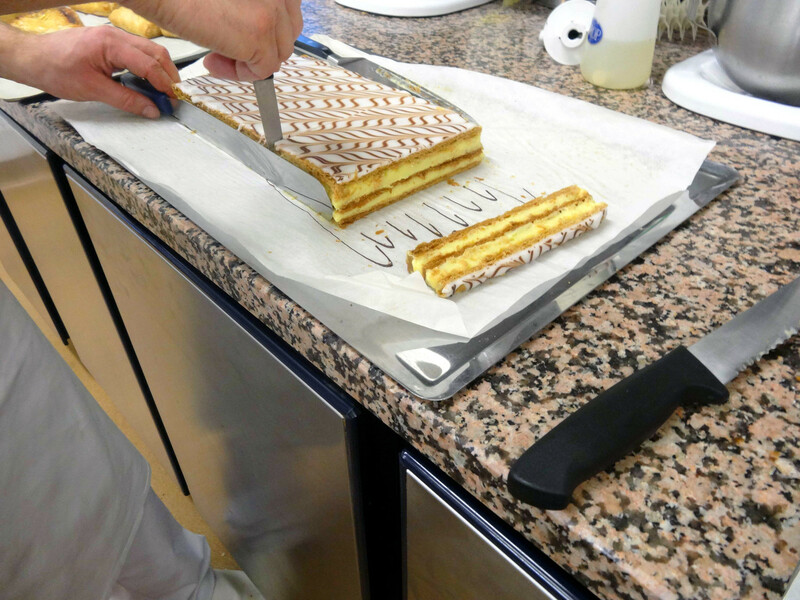 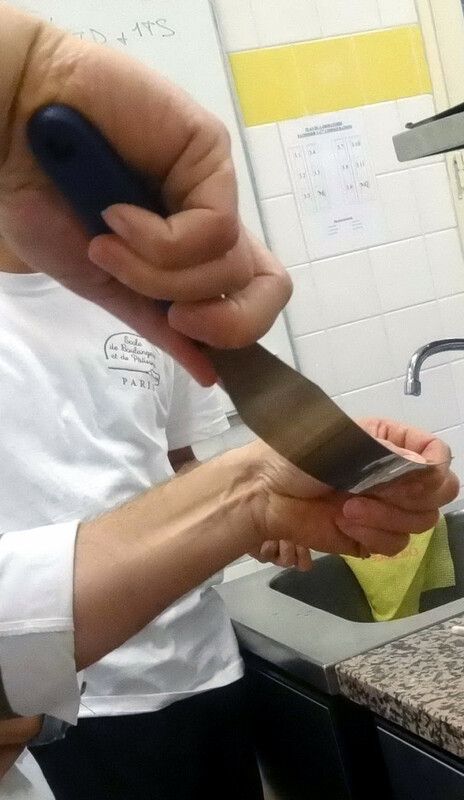 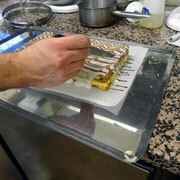 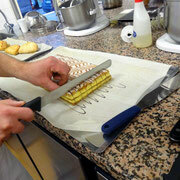 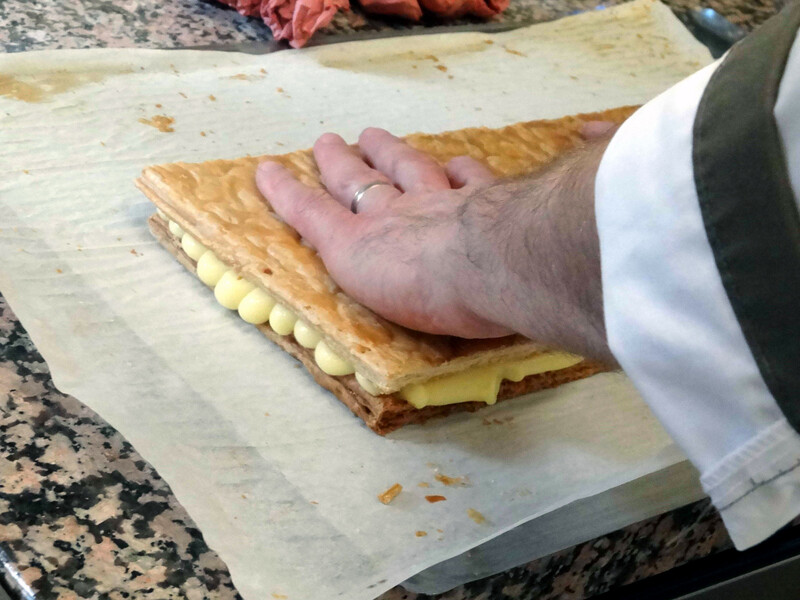 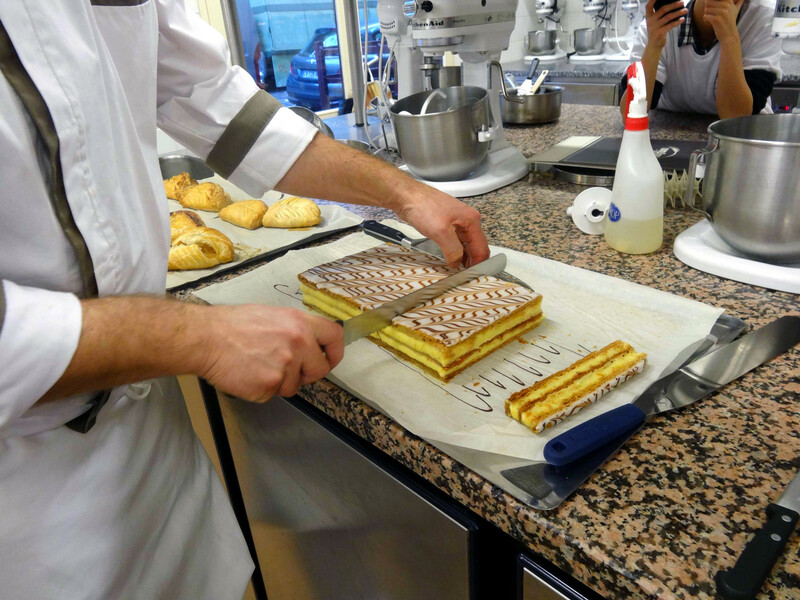 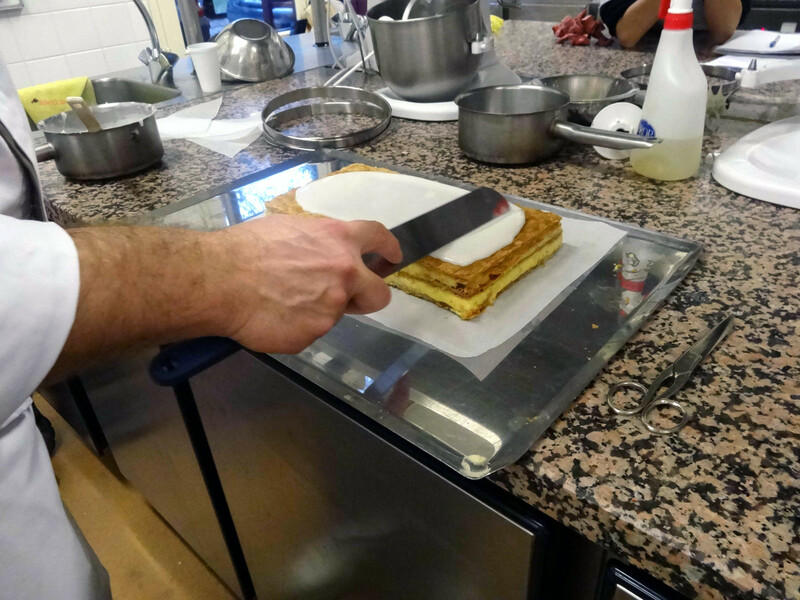 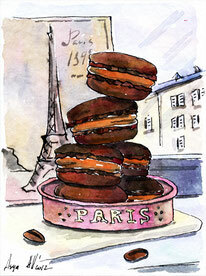 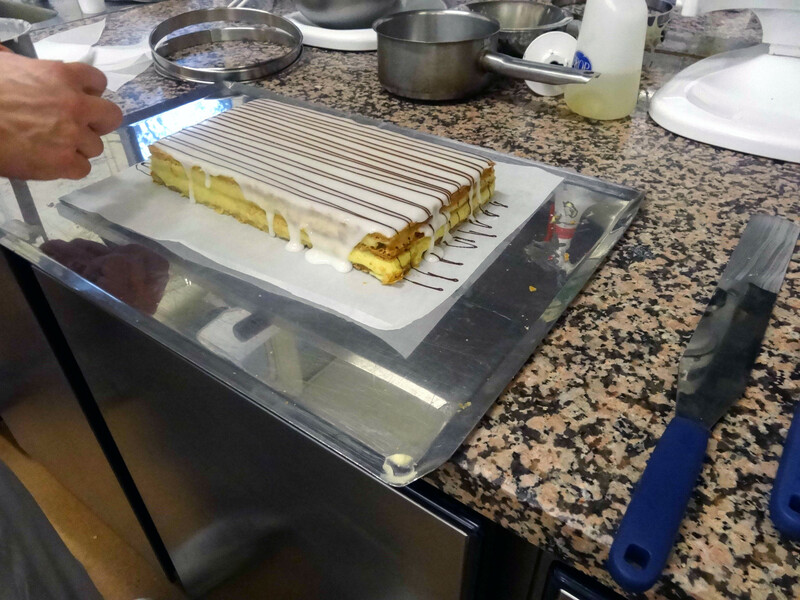 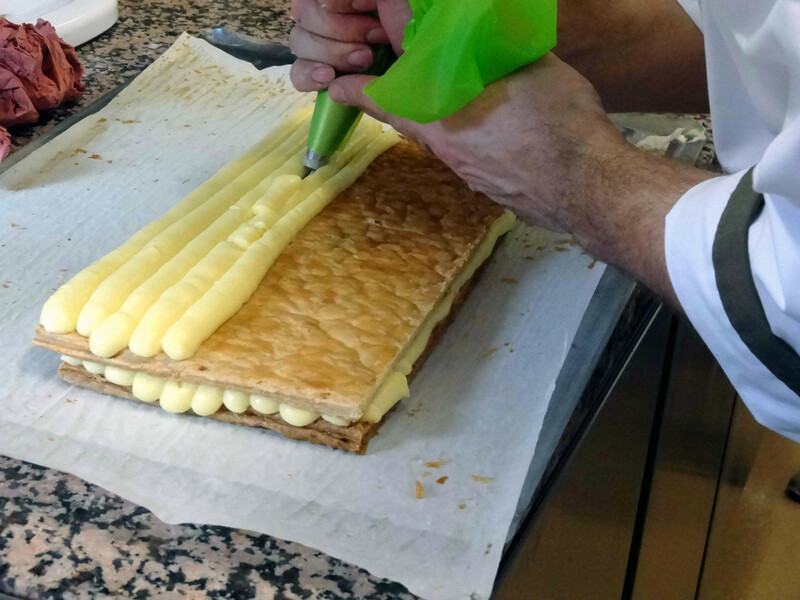 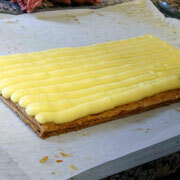 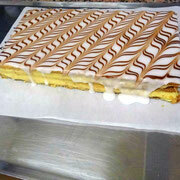 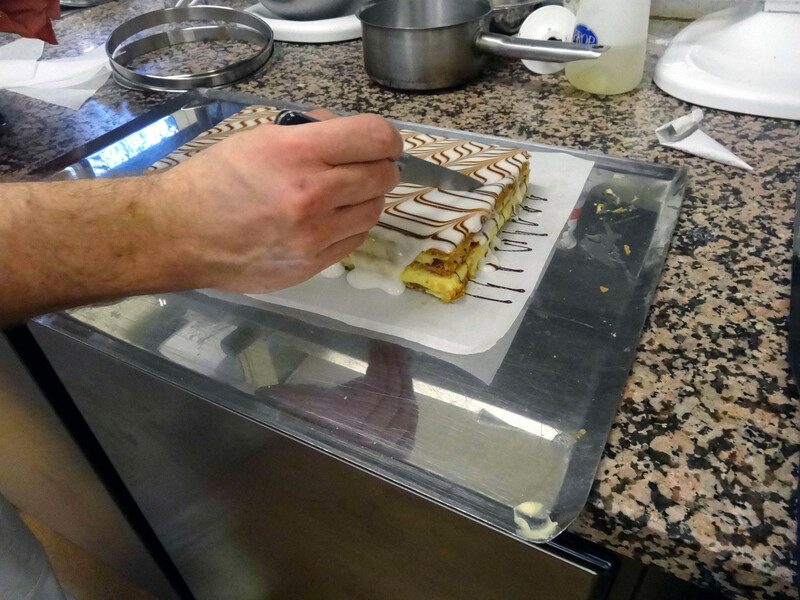 Gently run a palette knife across the top of the millefeuille ensuring a thin coating. 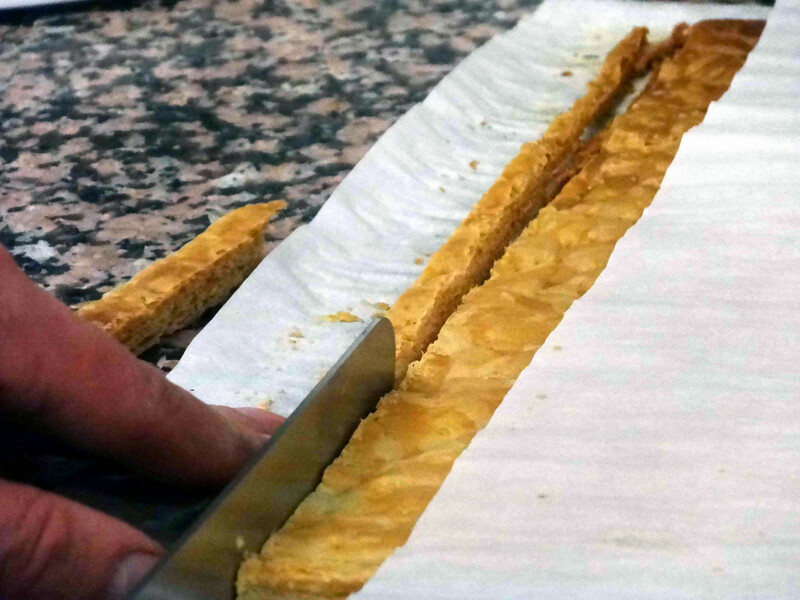 You can divide in indivividual pastries (Picture 36 & Picture 37). 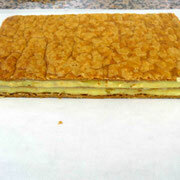 Rectangles size 12 x 5 cm.